One of the best models that are also incredibly simple to integrate into any interior is a clear glass coffee table. Due to its unusual shape, even a piece as seemingly simple as that will have what it takes to make a statement in any room. This is a perfect piece for minimalistic rooms. Another benefit of going with clear glass is that it creates a feeling of empty space, which makes the model a perfect addition to a compact living room. If you are working on a modern, mostly white living room, the best way to make a statement is to go with a black tinted glass coffee table. It will become an astonishing contrasting piece for a living room, furnished mostly in white. A contrast as classic as that simply can never go wrong. 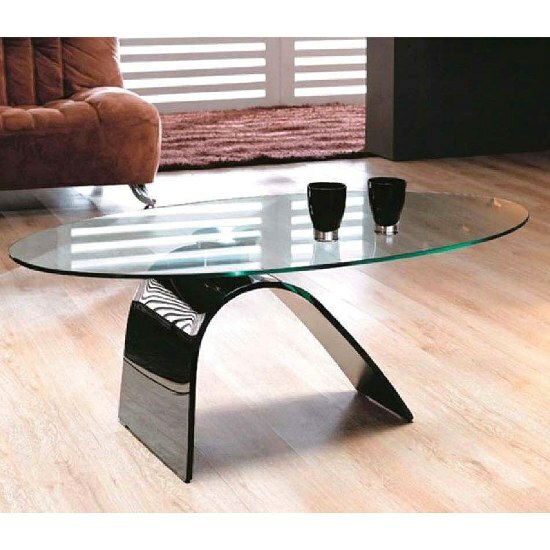 If you sofa is white, nothing will make the soft corner arrangement complete better than a black glass coffee table. Or, you could go even wilder on the colour palette and explore brighter tinted glass table. Once again, the approach is perfect for white living rooms, giving you an opportunity to add splashes of colour into your white decoration setting. A piece like this will give you a chance to place a really bright accent in any interior. Another suggestion you should consider is to make a match of a coffee table and another furniture piece. A TV stand is usually a nice start. However, given a specific shape of a bent glass coffee table, finding a TV stand that would be a perfect match might be a bit of a problem. A console table, on the other hand, is going to be a little easier. If the living room is spacious, you can easily have both. Finally, bear in mind that every little accessory in your living room contributes to a general decoration picture — sofa cushions, picture, frames, and — of course — the arrangements on your coffee table. With Easter just around the corner, it is possible to find a lot of thematic baskets to decorate a coffee table. On a typical day, some of these suggestions might come in handy.